I took my mountain bike up to Moulton Meadows Park in Laguna Beach today. 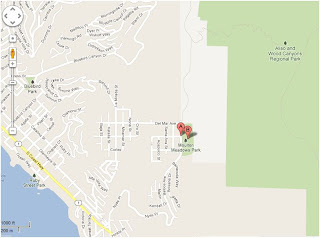 The park is situated on a ridge top with uninterrupted views of the ocean to the west and Aliso Canyon to the east. There is amazing mountain bike trail which runs from a locked gate in the park down into Aliso Canyon. Make sure to bring your helmet if you plan to ride into Aliso Canyon because the descent is steep and perilous. A good destination in Aliso Canyon to turn around is Dripping Hole Cave. You might be tricked by Google maps into trying to find an alternative return route, but the neighborhoods up here are gated communities. You have to come back up out of the canyon the same way you went in. It’s a tough climb back up that trail lugging a bike. The fog rolled in on me around 5 o’clock and it felt a lot colder than the actual 60 degree temperature. Next time I head out there, I’m going to do it on a sunny day. Moulton Meadows is a good place to bring the kiddies. There is a soccer field, basketball court, picnic tables, brand new set of bathrooms and a great jungle gym in the main part of the park. It would be a great place for a picnic or a game of Ultimate Frisbee. To get to Moulton Meadows park, you drive south on Pacific Coast Highway past downtown Laguna Beach. Turn left onto Nyes Place and drive straight up the hill. After a half mile, the road merges into Balboa Ave.The park is a half mile on the right past the intersection of Balboa and Nyes place. There is plenty of free street parking. The mountain bike trail starts at the North end of the park at the small locked gate.